This page maps programming concepts to specific tutorials and lessons. Find what you want to learn! Functions are things an app can do, like vibrating the phone or sending a text. They are built-in to the App Inventor language and can be called by your apps. Hello Purr, step 3, demonstrates setting function parameters. Conditionals are "if" and "if-else" blocks that allow the app to ask questions before determining what action to take. Animation-- action over time-- is a key concepts and a fun way to learn programming. TimedActivity-- How to program timed activity, including starting and stopping it. Shooter Game (AI1 only)-- moving characters, collisions, etc. Texting is a great way to add a social element to an app. No Text While Driving, a text answering machine. Android, Where's My Car? demonstrates the use of Location sensor. The Notetaker app demonstrates the use of (persistent) lists (AI1 only). Notetaker-- the user enters notes in a Twitter-like form. MakeQuiz-TakeQuiz-- the "teacher" enters quiz questions, the "student" takes the quiz. Chapter 22 from the App Inventor book. No Text While Driving, step 4, provides a simple example of persistence with TinyDB. Android, Where's my Car?, step 4, provides a simple example of persistence with TinyDB. Iteration means to repeat blocks. Need to do something a thousand times, or on each item of a list-- you need iteration. The Notetaker app (AI1 only) uses a foreach to display a list of notes, see steps 3-5. The Math Blaster App (AI2 only). The MathBlaster app generates addition questions for students and checks their answers. It uses for range to generate a random number of items in the equation, and foreach to sum the numbers up. 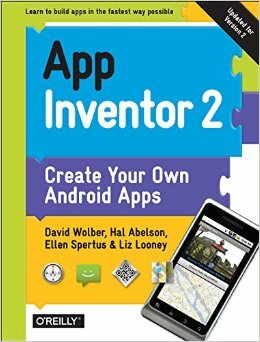 This tutorial is for App Inventor 2. Web data is persistent data that is shared amongst users and devices. App Inventor provides the TinyWebDB and Fusion Table components for this. Chapter 24 from the App Inventor book. Introduction to TinyWebDB-- includes video of a notetaker where notes are stored on web. Pizza Party sample using Fusion Tables-- tutorial by Ralph Morelli. Stock Market App-- an app that accesses data from the Yahoo Finance API.